Certain cinematic double acts exuded pure magic – Fred and Ginger, Laurel and Hardy, Tom and Jerry (well perhaps not, but you know what I mean). 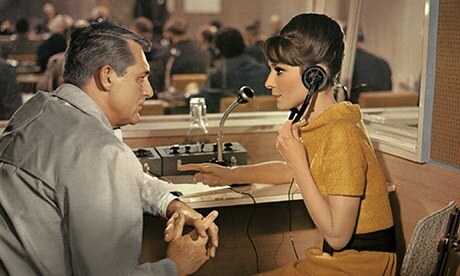 However ahead of the pack must have been that of Cary Grant and Audrey Hepburn, whose performance in director Stanley Donen’s flawless masterpiece Charade, is as intoxicating as a dry martini. Poor Regina Lampert (Hepburn) doesn’t know who to trust. Arriving home from holiday, she discovers her husband has died under mysterious circumstances. It appears he had a lot of money which has disappeared, and some rather unpleasant acquaintances from his past will stop at nothing to get it back. Then there is the enigmatic Peter Joshua (Grant), who just happens to have turned up purporting to have her best interest at heart, and offering to help her in her hour of need. But is he all he seems, or just to good to be true? On few occasions in cinematic history, can you say without fear of contradiction, that perfection was attained. One such occasion though is Charade, a sophisticated mix of romantic thriller and caustic comedy. ‘A’ list support from Walter Matthau, James Coburn and George Kennedy combine with a plot which would shame Ian Fleming and dazzling opening title sequence that outshines Saul Bass. However, perfect though these elements are, it’s really Grant and Hepburn that the viewer wants to see. That it’s obvious, before the film even starts, as to how it will end, is irrelevant. What’s sheer bliss to watch is the fun they have getting there. From the opening scene with Hepburn in a chic ski resort where she first meets the debonair Grant, to their paths crossing again in Paris, the chemistry between them simply fizzes with sexual tension. At the peek of their popularity, Hepburn had just starred in Breakfast at Tiffany’s (1961) and would next be seen in My Fair Lady (1964) , whilst Grant, let’s be honest, was never really out of favour with the public, the storyline is there simply to let the duo flirt outrageously which they do so at every opportunity. What more could you want? “They don’t make them like they used to” is often said too freely where classic Hollywood is concerned. However it’s a perfectly fitting description of Charade, and equally fair to say that they are unlikely ever to do so again.